Everything we have learned about hosting guests in our eight years of business is about providing the ultimate experience to visitors. So when designing this space, we tried to think of every little detail in order to maximize the comfort of your stay: Amazing ceiling heights, quality materials, comfortable furniture, fast WIFI, curtains, blackouts and colors that would make you feel good... and then we added a huge 6-person jacuzzi to it. No expense has been spared to bring you the most unique, comfortable and luxurious experience you can find in Cali. This huge roof-top unit is most likely the best short-term rental apartment available in Cali. The two bedrooms and 3 bathrooms make it a perfect fit for couples, groups of friends, executives, and digital nomads. It has hot water in all faucets, A/C and smart TVs in all rooms, and high-quality queen beds. Furthermore, the couch in the living room converts into a sofa bed, fitting one adult or two kids comfortably. The kitchen is fully stocked with everything you need in order to cook a meal or if inviting friends over for drinks. The open kitchen and outside dining make it easy to enjoy the warm climate. 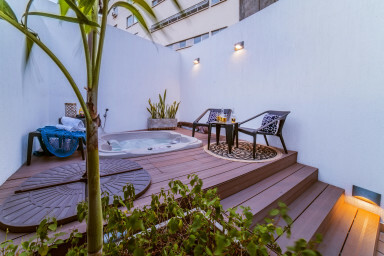 And is there a better way to wind down after a long day of sightseeing than sipping a cold drink in the jacuzzi?